Westvaco Corp., 1983. Brown cloth binding, gilt titles, gilded top edge. No DJ; in slipcase as issued. Commemorative stamp with portrait of Hawthorne pasted to front board. Illustrated endpapers, with 19th century engravings and stamp-motif separation pages. Slipcase also covered in stamp-patterned paper. Fine in fine slipcase. 341 pp.. First Thus. Hardcover. Fine/No Jacket. Book. HAWTHORNE, Nathaniel. 20 TALES. 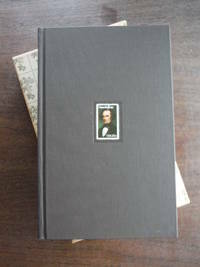 A selection of 20 short stories by Nathaniel Hawthorne, 1804-1864, who is honored this year with a com- memorative stamp issued by the United States Postal Service. The portrait reproduced on the stamp is a detail of the painting, 1850, by Cephas Giovanni Thompson, which is in the collection of the Grolier Club, New York. [No Place]:: Westvaco,, 1983. First edition [of this collection, "Privately Printed by Westvaco, Christmas 1983"]. . A fine copy in fine publisher's slipcase box. . Large octavo, brown cloth [with USPO "Hawthorne" 20-cent stamp on front cover, as issued], 341 pages, illustrated. Condition: A fine copy in fine publisher's slipcase box. Westvaco, 1983. First printing thus. Fine in fine publisher's slipcase in original publisher's shipping carton. Condition: Fine in fine publisher's slipcase in original publisher's shipping carton. Westvaco, 1983. Limited Edition. Hardcover. Near Fine. The book and slipcase are about As New in all respects. The book was designed by the 20th century art director and graphic designer Bradbury Thompson. The award winning designer was associated with Westvaco for more than 25 years and designed many of their limited edition books. Most items ship with tracking numbers and (generally over $15.00) jacket protectors if applicable. Clean recycled packing material will be used when possible. WESTVACO CORPORATION. GOOD CONDITION. BOXED. Westvaco, 1983. Hardcover. Near new condition, covers bright, text clean & binding tight in a like slipcase. 341pp., illus. Westvaco, 1983. 26th volume in this lovely annual gift series. Unusual cover design, with inset paste-on of the U.S. 20c Hawthorne commemorative stamp. Ribbon bookmark. Top edge gilt. In NF slipcase.. Hard Cover. Fine/No Jacket as Issued. Large Octavo. In Slipcase. Westvaco, 1983-01-01. Hardcover. Fine. Fine brown cloth covered boards (9.5" H x 6" W) with Hawthorne stamp on cover and gilt lettering along spine in original VG slipcase. Binding tight and square; contents pristine. No dust jacket. Laid in signed card. 341pp. Richly illustrated. Limited edition. Additional photos available upon request. All items carefully packed to avoid damage from moisture and rough handling. Westvaco. Used - Very Good. Great condition for a used book! Minimal wear. Westvaco. Used - Good. Shows some signs of wear, and may have some markings on the inside. Westvaco, 1983. 1st edition. Hardcover (Original Cloth). Fine Condition/No Dust Jacket. t.e.g. Brown cloth. Fine. Quantity Available: 1. Category: literature; Pictures of this item not already displayed here available upon request. Inventory No: 13110. .